→How Many Clubs Are Allowed In A Golf Bag? Golf is a sport known for its complicated rules. It seems that at least once a year a professional tournament spirals into a mess of confusion and frustration in the face of a complicated rules situation. Dustin Johnson, one of the game’s best, has been involved in several of them himself. Even most amateurs have found themselves paired with someone who is always policing the rules. To explain all of them would take a book, and in fact, the USGA already has a rather thick one covering golf’s do’s and do not’s. I’m sure that you want to be on the right side of all of them, but one of the most simple to follow is the golf club limit. You don’t want to break a major rule before you even step foot on the first tee, do you? Read on to make sure that you don’t. So, How Many Clubs are allowed in a Golf Bag? The simple answer to a slightly more complicated question is fourteen. A long time ago, back when the game was still relatively young, the USGA did not put those sort of limits on your golf bag, but as players began coming to the course with twenty, thirty, forty clubs to help themselves out of any situation, adjustments had to be made. But What Happens if You Have More? You can have less than fourteen clubs in your bag without needing to worry about a thing, but if you find yourself with more, that’s when you’ll start running into some problems. In tournament play, an extra club in the bag will earn you two penalty strokes per hole, for up to four penalty strokes before disqualification occurs. When is this rule in effect? Well, to start, this rule is going to be in effect in any tournament setting that adheres to official USGA rules. Outside of that, the answer becomes a little ambiguous. Golf is a game in which you are your own referee. You keep the score yourself and decide when there has or has not been a penalty that needs documenting. Technically speaking, if you are playing a casual practice round, you can carry as many clubs as you wish. I often carry a wide variety of extra clubs during my practice rounds. It can help you decide what sort of set up a certain course favors. For example, with some courses, you may want more wedges in your bag, or a hybrid instead of a long iron. You can figure that out in a practice round, but once the competition starts, you are locked in with fourteen clubs. Keep in mind also that if you plan on logging a round to help configure an official handicap, you are expected to have earned an honest, rule conforming score. Technically speaking, only you will know whether or not you cheated, but that is what makes golf a gentleman’s game. What if I have less than Fourteen clubs? Can I borrow a few from my playing partner? 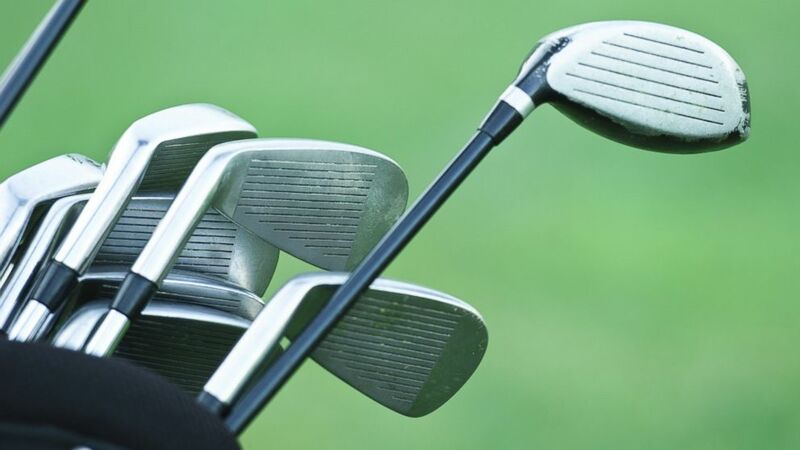 One would think that if you found yourself in the situation of having less than fourteen clubs, you could borrow one or two from your playing partner, no problem. Technically speaking, you can, but there are some stipulations. You can only borrow a club from a playing partner if the combined total of clubs in both of your bags equals fourteen. I know, right? That’s probably never going to happen, but in the off-chance that it does, you can try out your friend’s new driver guilt free! Well gosh. It’s so strict. What clubs should I use then? If the equipment limit seems a little stifling, don’t worry, it’s really not as bad as it sounds. If you plan your club set up right, there most likely aren’t going to be any gaps in your bag. But what is the right set up? That’s really for you to decide. Every player has their own preferences. Personally, I favor a bag with a lot of wedges. Right now, I play four, including the pitching wedge, which I find to be a good way to avoid half swings for the finesse shots that really make or break your score. Hybrids are also a good, multipurpose club that have been embraced in a significant way by amateur and tour players alike. PGA fans may recall the way Y.E Yang held off Tiger Woods with a bag full of hybrids at 2009 PGA Championship. I like them because they are good for replacing long irons, and fairway woods. I haven’t felt the need to carry a five wood in years since I added a hybrid in my bag, and that hybrid also takes the place of my three iron, making it a great way to free up some real estate in the bag. Again, the choice is yours. You’ll just have to play around to decide what club combination works best for you. Golf is a hard game. It’s probably one of the hardest sports to get into as a beginner. If you are just starting out in the game, and figure that any sort of league or tournament play is at least a few summers away, I wouldn’t worry too much about the fourteen-club rule. Don’t get me wrong, I’m not suggesting you cheat. If you’re playing to establish a handicap or bet a few bucks against your friend, you should play an honest game. But for the average weekend warrior, hacking it out of the woods, happy just to make bogey? Focus on learning what clubs you are comfortable with, and in short time you will most likely find that you have no problem playing with a USGA conforming bag. For the rest of us the rules are very clear. Fourteen clubs are going to have to be enough to get the ball from the tee to the hole. It’s challenging I know, but golf isn’t a sport that we play because it’s easy.